If you are a Ghost Adventures fan then you have probably seen the episode recently on the Slaughterhouse here in Tucson. If you’re not a fan, it’s ok I am going to tell you now about what happens there. First let me say that of course for TV things are going to be dramatically dramatized, otherwise, it wouldn’t make for good TV, right? Honestly, I could go on about the whole TV thing, that is a subject I can touch on a lot, but let’s stick to the subject at hand for now which is the Slaughterhouse. My team and I had been trying to get through to the Slaughterhouse house for about 2 years, we were wanting to investigate; we heard stories from people about the feel of that place and the haunts within. We wanted to see for ourselves what was there, but due to not having good contact information, we kept hitting dead ends. When I signed my contract for my upcoming book, I was determined to include them in it; so once again I reached out and this time got through. I contacted the owner, Bobby, directly and explained who I was and what I wanted to do. We meet up and he told me that they were being featured on GA and that he knew he would be getting contacted a lot about investigations there and wanted to team up with someone who has been doing them. We decided we would work together on public ghost hunts, but first I wanted to be able to investigate with my team to see what was there and get proof for myself and to post our evidence. We did two nights of investigation. One on a Wednesday night from about 7pm-11pm and one on a Saturday night from 10pm-2am. Let me say we weren’t disappointed. 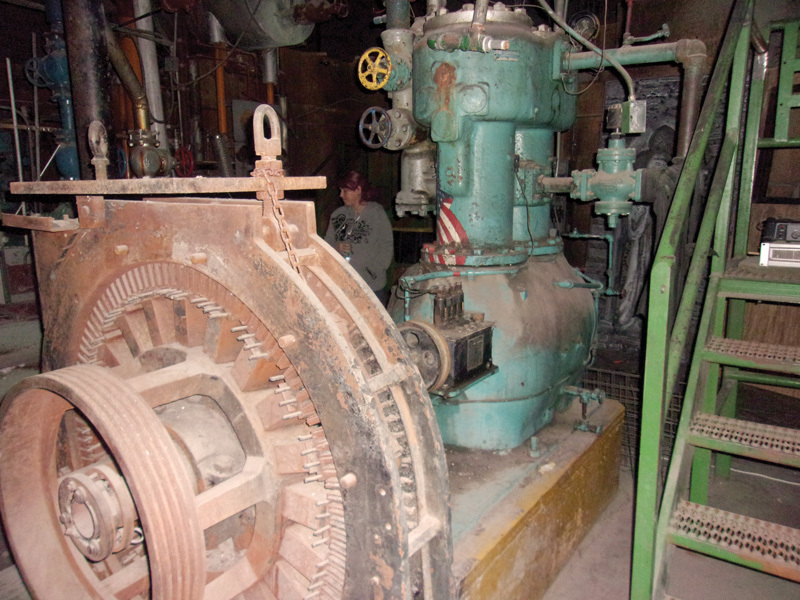 Our first investigation we went through the entire building because we wanted to get a feel for it, see what kind of Electric field there was, and to see if the ghost had a favorite spot or not. The second time we focused on just the areas that seemed to have the most activity in them. 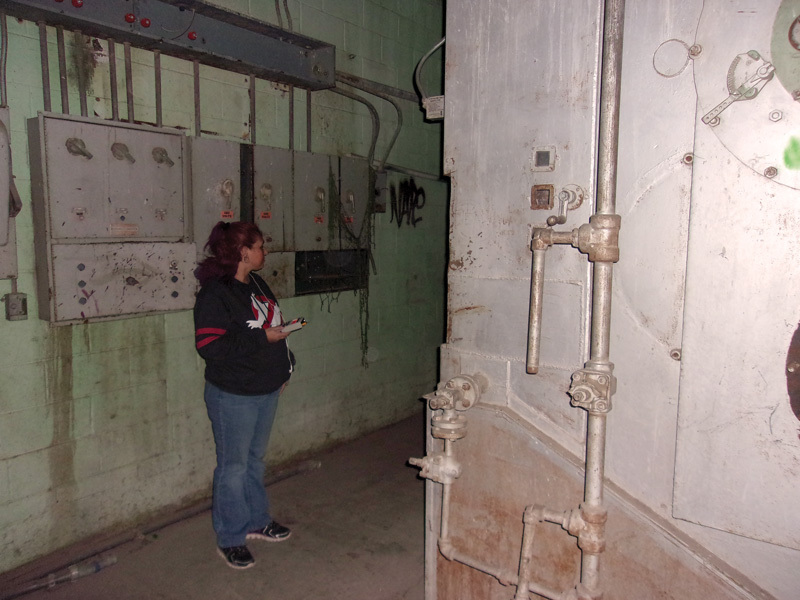 We received voices from both nights and discovered more than one ghost lingers in the Slaughterhouse. We know for sure of a female and male that made themselves known and they are a bit of a prankster. On the second night I had felt like I walked through cobwebs while I was standing still (that is known as paranormal activity, it’s a way of them making contact), of course, we looked and no cobwebs and with me standing still it doesn’t make sense that I didn’t feel it sooner. Shortly after o had that feeling, my husband felt as if he got touched, then about 15 mins later when I walked to a different area I felt as if my hood and gotten tugged on. I had other team members say they felt as if they were touched too, but none of us ever felt threatened. I admit though that place already has a creep factor because of what it was and is now; they have all kinds of creepy things in the building so it already gives you a mindset of being creeped out, knowing there is paranormal activity in there may give people an even scarier feel to the building. The paranormal activity wasn’t scary to me, the props were which if you watch our video on YouTube you will hear me screaming over the props, then again being that I investigate the paranormal because it’s my passion; that probably explains why that part doesn’t bother me as much. So our two-night investigation led the receiving a ton of EVPs and being touched; I had mentioned earlier that there is a prankster and let me tell you why I say that. At one point in time in the evening, we left our recorders alone in a room. I know for a fact no one was in the building because we were watching cameras for activity. During this time something came up to my recorder and flicked the microphone on it; during another time someone came up and literally yelled “boo” into my recorder! Seriously a ghost yelled “boo”; if that’s not a prankster I don’t know what is. I can honestly say that was a very interesting place to investigate and we are still trying to put together more YouTube videos of our evidence that we captured. We loved the place so much that the team even did their new escape room and we made it out alive in one piece! I am not one for fake haunted houses so I won’t be doing those come Halloween, but I do look forward to taking the public into Slaughterhouse and getting to know the ghost there even better; maybe I will try to play some pranks on them? Public ghost hunts start in February, so if you want to check out the creep factor to the Slaughterhouse feel free to if you dare!! Just remember though; you are never truly alone!